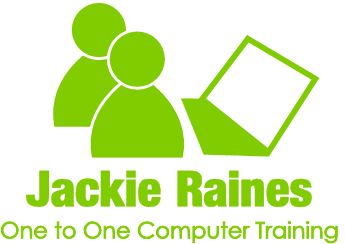 Jackie Raines works as a freelance computer trainer and home computer tutor offering computer training and smart phone tuition and home computer lessons in Thanet and throughout Kent. The company was established in 2008 and has many happy clients throughout Kent - Margate, Broadstairs, Ramsgate, Birchington, Deal, Sandwich and Canterbury. Website designed by Jackie Raines. Copyright © Jackie Raines 2019. Today’s world of technology can be a confusing one. Things move so fast it can be a struggle to keep up. If you have a desktop PC, iPad, tablet, laptop or smartphone and need some guidance, I can help. Whether it’s finding information on the internet, sending emails, online shopping or something more official for work, I’ll help you learn the things you need. There is no set course; I’ll work with you until you are confident in doing the things you want. Relax & enjoy yourself ! Setting up the computer, phone or tablet, using a mouse or touch-screen, common terminology, ‘Apps’ explained, keeping safe on the internet, closing down safely and much more. Excel (spreadsheets), Word (letters and documents), Publisher (adverts and leaflets), Outlook (emails) and PowerPoint (presentations). Most people know a little bit, but would like to be able to do things better and with more confidence. My one to one guidance will take you through the areas you are unsure about, at your own pace. Helping you gain the confidence and skills to do more with your Computer, Tablet or Smartphone. Struggling with your new phone? Want to do more with it that just make calls and text? Smart phones are here to stay. Whether you have an Apple iphone, Samsung, Huawei or other Android phone, I can help you find your way around this strange new device. Call to book or find out more. All lessons take place at your home, using your own equipment.